NDI®, NDI|HX, Visca over IP, RS422, and RS232. By harnessing BirdDog’s next generation NDI® and IP technology, it’s never been easier to discover, connect, and control your PTZ cameras. Featuring superior ergonomics, premium buttons and joystick, all in a beautiful form factor this is the PTZ controller you have been waiting for. The beautiful multi-coloured buttons and keys gives easy visual cues and makes using the PTZ Keyboard a breeze. Set up to 256 presets with memory of image parameters including camera moves (requires camera support). Universal control - Never before has a PTZ controller been so flexible. PTZ Keyboard is the world’s first PTZ controller with NDI® and NDI|HX support. Along with NDI® there is support for Visca over IP, RS422, and RS232. Beautiful ergonomics - Using the PTZ Keyboard is a breeze with well thought out button layout. Quickly access all the cameras on the network, and set up quick access buttons for all your favourite settings such as Exposure, Focus, Zoom, and movement speeds. Power over everything - Super flexible powering options allow you to power the PTZ Keyboard from Power over Ethernet (PoE), DC in, or even over the serial port. Never get stuck in a situation where you can’t power up. 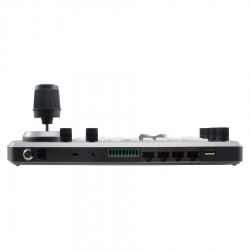 Comms - PTZ Keyboard is the world’s first PTZ controller with Audio Intercom support over NDI. 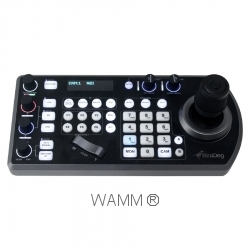 PTZ Keyvboard is compatible with BirdDog Comms. Comms is a complete Audio Intercom solution which can run on any Windows 10 compatible computer, laptop, or surface for a touch screen experience.